In globalization era, the existence of air transportation increasingly needed. Especially as as the bustle of the world transportation. In addition, Airplanes make travel faster and easier. Then, now many people switching to airplanes for travel both of short and long distances. So, the development of tourism in Indonesia is running fast to improve between quality and quantity of air transportation. Nowadays, most of the airline improve by optimizing its services. On the other hand, Indonesia has dozens of airports spread around in various cities. Whether it has local or International status, most of them start to improve the infrastructure which reliable to field. It improves to more beautiful, modern, and sophisticated. Then, there are several Best airports in Indonesia which already recognized in the world. Sultan Aji M Sulaiman Airport Sepinggan popular as Sepinggan Airport. The name of Sepinggan taken from village in Balikpapan, one of city in East Kalimantan. Then, Sepinggan Airport has an area of 294.9 m². It has a track between domestic and international flights with 21 check-in counters. Next, the airport has three terminals, GF Terminal A, Terminal B, and Terminal A FF. Departure terminal located in terminal A first floor, while the arrival terminal located on the 2nd floor. Both of terminal serve between domestic and International. Domestic terminal which has 9221 m² of measurement can serves 900,000 passengers in a year. Meanwhile, International terminal has 2.302 m² can serves 200.000 in a year. Moreover, to support the convenience of car owners, the airport providesthe parking facility that can accommodate thousands of vehicles up to 17, 765 m². On the other hand, the best of Sepinggan Airport can be seen in their aesthetic interior. A little touch of Dayak ethnic nuances in modern buildings are safe as well as comfortable. Sepinggan apply modern design and inserted ethnic nuances of Kalimantan. Then, Airport architecture tries to remind visitors of the enchanted tropical forests of Borneo lay concrete pillars. For almost in every corner decorated by artificial gardens with various types of orchids. One of them is Black Orchid. Focus on passengers comfort, They provide some great facilities such as escalators, lifts, until first-class security. Meanwhile, the introductory car of passenger straight flat on the third floor which reserved for passenger departure. The separation of the departure terminal purposes so that there is no buildup between passengers. Moreover, the glass walls stand proudly on the left, right, even at the roof so that lights could be extinguished during the day. Then, the atmosphere inside the building remains fresh matches with visitor preference. 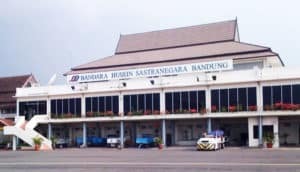 Hussein Sastranegara Airport is the main gate of West java and become main gateway for Southeast Asia passengers. It located between Maleber and Padjajaran, while the distance from the city to the airport is about five kilometers. The airport was a relic of Netherlands East Indies government. Then, name of Husein Sastranegara taken from a military air force pilot who killed during training flight on September 26, 1946 in Jogjakarta. This airport has one terminal with an area approximately 17,000 m² which serves both domestic and International flights. Then, the capacity of passengers can reach up to 3.4 million per year. Nowadays, the airport carrying out the concept of modern eco-airport while maintaining the local cultures. On the other hand, Husein Sastranegara has a theme “Modern with Traditional Nuances Airport”. The buildings design inspired by architecture of “Leuit” roof in West Java traditional house and “Julang Lapak” (Sundanese traditional house), as well as traditional weapons. It airport brings out the concept of airport boutique. Then, the design of interior inside airport provide the atmosphere similar like we visit the gallery. There are an exhibition of paintings and also traditional music. Moreover, on the walls are displayed works of art and video tourism, library, internet room and other high quality facilities. Husein Sastranegara International airport serve 40 flights in a week and 64 domestic flights in a day. It also known as Denpasar International Airport. 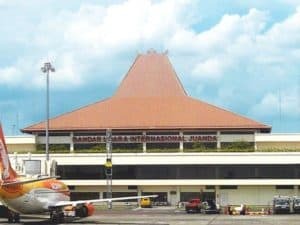 Ngurah Rai is the largest airport managed by Angkasa Pura corp. Angkasa Pura I, known as PERSERO, is an institute which manage all about airport services. Then, Angkasa Pura has 13 flights spread across Central and East region in Indonesia. As the one and only airport in Bali, brings it as the main gate towards every East and Central territory. On the other hand, this airport has an area of approximately up to 135,000 m². It can provide class B of 747-400 airplane for a distance from Denpasar to Tokyo without any load restrictions. As well as other public facilities like parking lot with area of 51.348 M². On the other hand, as International airport, it equipped with International standard facilities to treat the view of Bali. There are two terminal area for domestic and International. The domestic terminal has 14.791,86 M² while International terminal has 65.898,5 M². Then, for landing helicopters, provided three helipads. The domestic terminal facilities include 62 the number of check-in counters, transit and transfer counters, 8, 9 ticketing counters, 8 boarding gate, 5 units of conveyor belt and other support. Moreover, this airport has the fastest wifi facilities compared to other airports. Best international airports in Indonesia from the aspect of security and safety in 2007 given by the department of transportation republic of Indonesia. Assessment of public service units according the department of transportation in 2007. Airport with zero accident in implementing occupational health and safety program in 2008. The airport located in Blang Bintang District, Aceh Besar, Sumatra island. 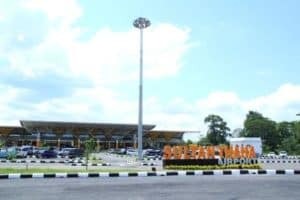 Its one of the largest airport in Aceh and serve domestic and International flights. For domestic flights, there are three airlines, such as Garuda Indonesia, Lion Air, and Susi Air. While for International flights only two airlines, Air Asia to Kuala lumpur and Fair Fly to Penang, Malaysia. Then, this airport has functioned as transportation of medicine delivery in 2004 Indian Ocean earthquake. It went back and forth from various regions all over the world to displaced people who isolated and hit by Tsunami. 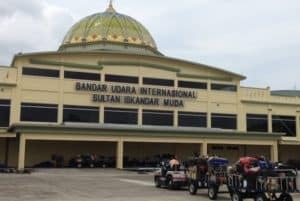 On the other hand, Sultan Iskandar Muda airport has a 3,000 meter length with width as wide as jet liners body. In general, the airport area was built with the concept of modern architecture with Islamic and traditional values. The hallmark of the airport are the three domes resemble like mosque. Then, three domes symbolize three special things in Aceh namely Religion, Culture, and Education. Meanwhile, this airport serves flights scheduled airlines by the number of departure-arrival. It as many as 18 domestic flights and four international flights. Moreover, International airport of Sultan Iskandar Muda, Aceh, recognized as the winner of the category World’s Best Airport for Travellers in World Halal Halal Tourism Awards 2016. Soekarno-Hatta airport is the largest airport in Indonesia. It becomes a main gateway of the International arrival and departure and has a very important role. Then, the name of Soekarno-Hatta taken from two national heroes of first president and vice president in Indonesia. This airport located in Tangerang city, Banten and one of the airports with the most number of passengers in Indonesia. There are 2/3 of total airlines flight and about 32 million people in a year pass through this airport. Nowadays. there are construction of third terminal for domestic flights Air Asia and Mandala. On the other hand. there are several high quality facilities for provide best services to passengers. Such as two terminals with each of them are 312,522 m² and 564,000 m², two cargo terminals for International with 36417m² 464,340,080 M² and 12421m² for domestic. Then, two parking lots in both terminal with capable to load up to 3000 vehicles. As well as public services such as Bank, public telephone, restaurant, and stores. On the other hand, there are several International airlines which flight pass by this airport. Such as Korean Air, Japan Airlines, China Airlines, Kuwait Airlines, Saudi Arabia Airlines, Air India, KLM Royal Dutch Airlines, and more. 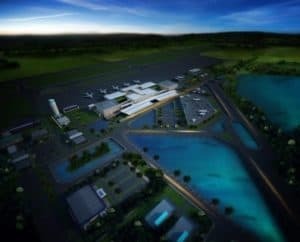 Kalimarau Airport located in Berau district and will become one of International and the largest airport in East Kalimantan. 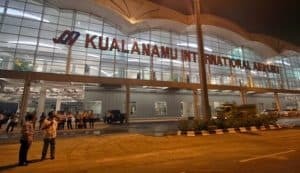 Currently, the airport has used by several airlines such as Kalstar Aviation, trigana air service, Batavia Air Boeing 737-300, and Sriwijaya Air Boeing 737-200. On the other hand, while entering Kalimarau airport area, It offered a futuristic view of small buildings with a roof tent concept similar like the arrival of King Abdul Aziz Airport, Jeddah. Then, there are minimalist gardens with fresh green grass and hard woody plants spacing on it. The architecture is very neat and sophisticated. As well as the impression of a fresh, minimalist, simple, and orderly. Moreover, the space of airport check-in decorated by ornaments sculpture and typical Dayak-dominated with relief of turtles life. The airport located in Makassar, South Sulawesi and become the gateway to Eastern part of Indonesia. The width of airport reaches 381 hectares. Then, the name of airport taken from King of Gowa Kingdom . There are some facilities such as 48 Check-in counters, VIP, international departure, and of course domestically terminals. Domestic terminal has 53 045 m² area and 5.3 million passengers in a year, while International has 8770 m² area and 900,000 passengers in a year. As well as cargo terminal. Meanwhile, the airport has two runways of the first round of 3,100 m x 45 m, and the second 2,500 m x 45 m. domestic departure lounge consists of gate 1 to gate 6, clothing stores, ATM platforms. On the other hand, the roof using a metal material type of titanium sheet. Some rooms like check-in area is protected with foam spray system while the sprinkler system is applied to all parts of the terminal. 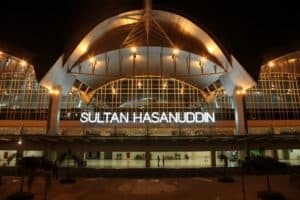 Sultan Hasanudin airport recognized as the best three airports in Indonesia. Moreover, it also received the award for New Airport Compact and Clean Public Toilets. Juanda International Airport located in Surabaya appropriately in Waru district, Sidoarjo regency. It is the second largest and busiest airport in Indonesia after Soekarno-Hatta according with amount of airlines and passengers. Then, the airport has a runway 3,000 meters long and 45 meters wide, with a broad measure of the existing terminal at this airport amounted to 51,500 m². Parking lot at Juanda Airport also fairly widespread and approximately 28,900 m2. It can accommodate vehicles in large capacity. On the other hand, there are several airlines which flights in this airport such as China and Singapore airlines, Eva air, and Cathay pasific. The professional management of passengers services in order to serve the passengers well. Bus facilities for taking passengers. Taxi services for smooth transportation of passengers. The complete and adequate facilities. The strict airport security systems for keep passengers safe and comfortable. 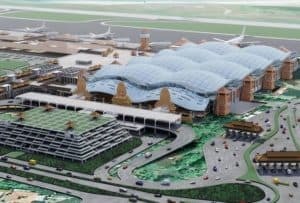 In 2017, Sultan Thaha Airport will managed by Angkasa Pura II corp. Currently there are 4 airlines that every day do the flights 12 times, including Garuda Indonesia, Citilink, Lion Air and Sriwijaya Air. Then, it has terminal designed with an interior design ‘zoo’ is equipped with various facilities such as the Self Check-In, a computer for free internet, wifi, smoking room, charging station, to cafes and restaurants in the waiting room. Since December 2015, the capacity of Sultan Taha Airport increased from 700,000 per year to 1.6 million people per year. Moreover, there are 46 flights to and from Sultan Thaha Airport. It become pride for Palembang people. This airport serves international flights directly to Malaysia and Singapore. As well as it uses for transit airport to several areas in Sumatra such as Medan, Padang and Batam even to Bali. There is a miniature pyramid house before the entrance to the departure lounge, while a cabinet with Palembang typical carvings is in arrival gate. Moreover, there are Palembang songket cloth and the following unique items typical of Palembang province inside the cabinet. On the other hand, the complete general facilities are available at the airport. Such as automatic teller machines, a few large banks, places to eat, mini market, internet corner, a mosque in the parking area and mosque in the waiting room. As well as rest area and place for children who wants to play various games under the supervision of his parents here. Ahmad Yani Airport is one of the international airports managed by Angkasa Pura I corp. The airport is a gateway and the cutting edge of air traffic for western part of Semarang city. As an international airport, It serves both domestic and International. Meanwhile, airport name is taken from one of the heroes of the revolution Indonesia, Achmad Yani. On the other hand, Ahmad Yani Airport is only airport with the theme of eco-friendly floating airport. Then, it built on water and become the first airport on water in Indonesia. For facilities, Ahmad Yani Airport provides Trolley, Toilet, Pray room, smoking area, Parking lot for both cars and motorcycles owned by passengers. As well as there are reading corner with concept is full highlight for the impression of a traditional Java. Kualanamu is the second largest airport in Indonesia after Soekarno-Hatta. All airport acitivites performed by a computerized systems. 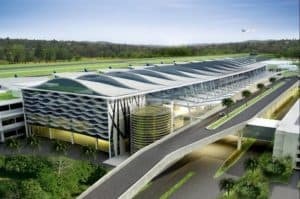 Then, the airport also equipped with a baggage handling system, the good will be placed in airplane baggage in sophisticated and automated ways. The separation of goods is no longer done manually. Goods also will undergo check-in process. Meanwhile, there are 15 airlines that ready to serve flights to and from Kualanamu. Such as Susi Air, Wings Air, Garuda Indonesia, Lion Air, Sriwijaya Air. Then, there are also Mihin Lanka, Malaysia Airlines, AirAsia Berhad. In addition, Firefly, Silk Air, Singapore Airlines. Then, the capacity of Kuala Namu Airport is nearly ten times more than Polonia. Kualanamu able to serve as many as 8.1 million passenger movements per year . Kualanamu surrounded by the waters of the Strait of Malacca. There are various beaches around the tourist sites, such as Mirror Beach, Coastal Gudang Garam, and Labu beach. Then, there are restaurant, gift shop, sports centers and postal complaints for TKI. Moreover, the beautiful and magnificent architecture makes Kualanamu more spectacular. The airport is also equipped with a gallery of photographs themed North Sumatra. 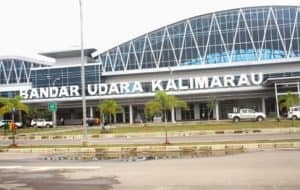 Kualanamu also emerged as the first integrated airport to the train station. 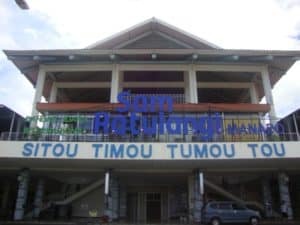 Sam Ratulangi Airport is located in Mapanget District, North Sulawesi Province. It is one of the international airport that serves domestic and international flights from and to Manado. Then, for domestic flights this airport serves all of these areas, while for international destinations such as Singapore, the Philippines and Kuala Lumpur – Malaysia. On the other hand, Sam Ratulangi Airport has a comparative advantage compared to other airports to be a gateway (gateway) northern region of Indonesia. It lays on geographical position close to the Asian market which had a future product namely ecotourism. 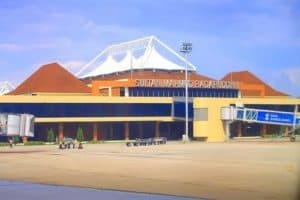 So, the comparative advantage is the opportunity for Sam Ratulangi Airport into the entrance of tourists and investors coming from various countries of the world. The airport has several important aspects such as traffic forecasting. Then, the estimated number of flights will increase from the needs of the community. Meanwhile, the development and construction of airports in Indonesia growth significantly. 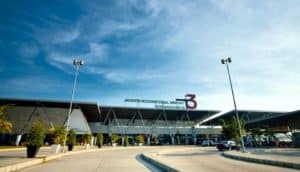 It can be seen in several cities that are often visited by foreign tourists as Bali, Lombok, Medan, Makassar has an airport that can accommodate so many passengers of domestic and international flights. Even several of them recognized as International airport. So, Indonesia worthy to get a predicate as country which has the most airports with International standardized.